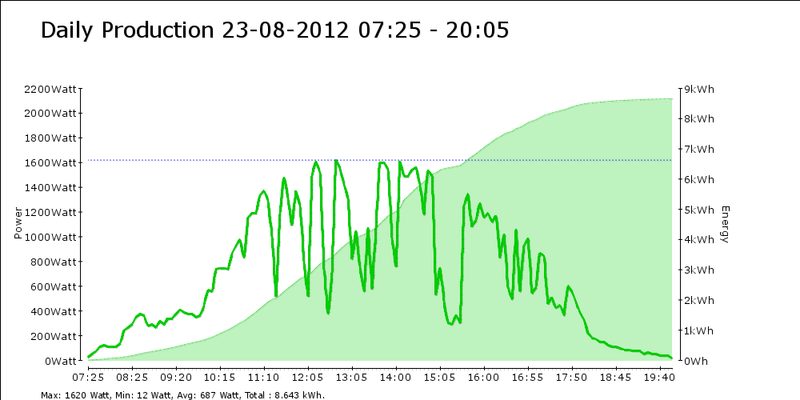 Previously I have setup my Raspberry Pi so that it reads the output of my SMA 1600TL solar panel inverter every 5 minutes. It stores that data in a local MySQL database and posts it online to PVOutput.org. You can read about that setup here. So, I created a script that creates a daily graph, using the data in the MySQL database (no need to get from PVOutput what we already got) and then mails that to me. I have setup a cronjob so it happens every evening at 9PM. I have documented the steps below in case you also want to do something like this. Note: the setup is for SMA-Bluetooth, so even if you have a different inverter than I have, it should work. Create a group and user for Apache. The group might already exist, no problem, just ignore the error in that case. We now have a writable www directory with a simlink making it a bit easier to find. Now setup PHP. We probably don’t need all the libraries installed here, but I installed them anyway. Edit the first six lines of the file to match your gmail account info. Make sure you edit the mailreceiver and rename the file to remove the .txt! You can also run it straight from the browser, but remember that it takes some time to generate the graph! 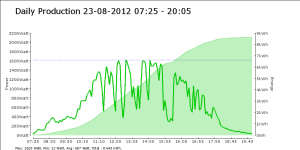 [26-8-2012] There now is a version 2 of the script available that also show temperature data in the graph. Don’t worry, the version 1 is a requirement, so you are almost done. Just proceed to the setup for version 2.